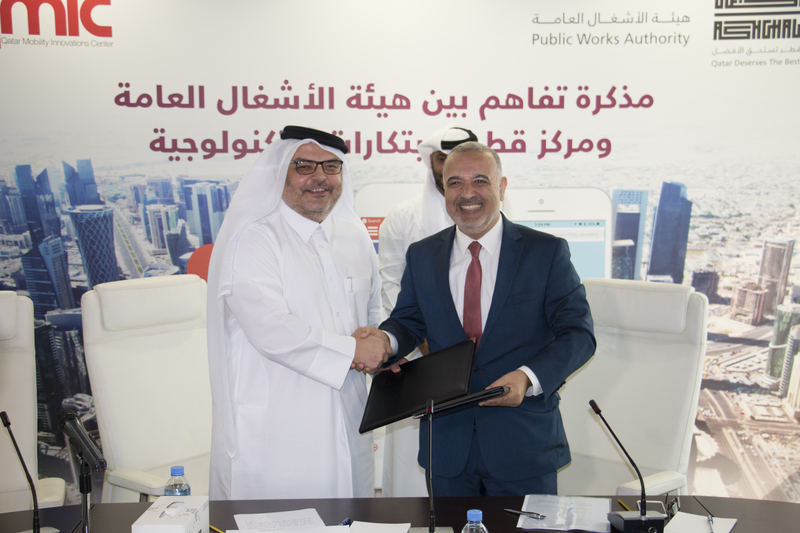 Ashghal and QMIC sign MoU for Cooperation​The Public Works Authority ‘Ashghal’ and Qatar Mobility Innovations Center (QMIC) signed a Memorandum of Understanding (MoU) for cooperation through “Wain” application, in an aim to guide road users and provide updated information on new roads and traffic movement. The MoU was signed during a press conference held today, 19 November 2017, by H.E. Dr. Eng. Saad bin Ahmad Al Muhannadi, President of the Public Works Authority, and Dr. Adnan Abu Dayya, Executive Director of “QMIC” in attendance of Dr. Mohammad Jaham Al Kuwari, President of the Qatar Cycling Federation, and Dr. Jamal Rashed Al Khanji, Founding Member of Qatar Cyclists Centre. The MoU is considered a strategic partnership between two national institutions that are committed to ensuring that road users can reach their destinations easily and quickly. It also aims to achieve the Qatari government’s direction to encourage cooperation with Qatari producers and developers, and to make the most from all completed roads and infrastructure projects through introducing the new lanes formed by roads projects that are completed, in order to enhance traffic flow and improve the lives of citizens and residents alike. The application, which is fully developed and produced in Qatar, includes the latest dynamic maps of Qatar’s roads networks, as well as cycle and pedestrian ways, in addition to several other services provided by the application in Arabic and English.Features of “Wain” Application:Wain application offers many valuable features for road users in Qatar. It provides the latest maps of roads networks that help road users reach their destinations easily and quickly, in addition to providing a comprehensive view of traffic conditions and congestion areas according to information collected through a comprehensive, multi-source data collection network.In addition, the application provides Navigation service using the digital addressing system “Enwani” as an additional option to reach the desired destinations, as well as the feature of displaying the most important current and planned events, allowing users to easily discover events and navigate to their locations.Wain application alerts drivers when they pass the legal speed limit near fixed-speed cameras, for their safety and the safety of other road users. The application also sends notifications to users about the availability of car parking in many important locations. Through the application, users can also share information via social networking platforms.It’s worth mentioning that Qatar Mobility Innovations Center (QMIC) is the first independent innovations center in the region that focuses on the use of Information and Communication Technology (ICT) in developing smart mobility systems and services. The center provides Internet of Things (IoT) platforms, solutions, and services in specialised domains including Intelligent Transport, Logistics & Telematics, Road Safety and Environment.Through its offices at the Qatar Science and Technology Park (QSTP), QMIC works in coordination with key national partners and decision makers to create an innovative environment that focuses particularly on the local market in Qatar. Cycle Ways:In the context of increasing the road users’ awareness of the new lanes formed by the recently opened projects and their most important features, which can also be identified through “Wain” application, the press conference also included a presentation about the progress of cycle ways and pedestrian paths’ network in the projects implemented by Ashghal within its expressway and local roads’ programmes. This comes as part of Ashghal’s plan to provide alternative transportation options inside and outside Doha, in line with the country’s general plan to promote the use of alternative means of transportation and to adopt an active lifestyle.In some of these projects, separate cycle ways are provided, while other projects in internal and residential areas include shared cycle and pedestrian lanes. It is planned that 258 km of cycle and pedestrian ways will be opened along highways and main roads by the end of 2017, to reach 540 km of cycle and pedestrian ways by 2022.These lanes currently include over 100 km on the Eastern and Western sides of Al Shamal road, 29 km along Al Sheehaniya Leatooriya Lijmiliya Road, and around 18 km of open cycle ways along Dukhan Highway connected to around 18 km on the Celebration Street for a total of 36 km. This is in addition to long sections of Al Shamal Road that are provided with cycle ways. Cycle ways are also provided on the sides of the G-Ring Road at a total of 42 km and around 21 km on the Northern and Southern sides of the road. The cycle lanes on the Northern side of the G-Ring Road are connected to the 13 km cycle lanes in Ras Abu Abboud Road and Al Matar Road, forming a connected lane with a length of around 34 km.The Public Works Authority is also constructing cycle and pedestrian ways in local areas, not only along expressways, where it is planned that around 133 km of shared cycle and pedestrian ways will be completed by the end of 2017, distributed in the areas of Bani Hajer, Slata, Al Sailiya, the West Bay, Al Khor, and around Qatar National Museum. By the end of 2017, around 10 km of dedicated cycle ways will be completed, in North Al Wukair and West of Al Wakra.These lanes are being constructed according to the highest specifications and safety standards. A sufficient separation is provided between the cycle ways and the main roads, with several lanes surrounded by beautification and landscaping.